Did I forget your birthday? I am SO SORRY. Belated birthday greetings. You look terrific; evidently age improves you. Well done! It was my birthday yesterday – and, oh come on, let’s face it, if you REALLY CARED you would have already called me to sing ‘Happy Birthday’ with a bonus verse of ‘For She’s a Jolly Good Fellow’ and a few hip-hip hoorays. And you can hope I had a great day all you want – and thanks for the sentiment – but it was crap, now you mention it. It started off well enough, with a card and presents in bed. The most exciting of which was a flame-thrower – more accurately, a gas torch – for caramelising crème brulees. I’ve given up going out for dinner with the man because it’s too embarrassing being asked to leave after Andrew sets fire to the tablecloth. This morning, MarkJ tried to make out that there are worse things to be kicked out of a restaurant for. What would that be, MarkJ? Setting fire to the waiter’s FACE? However, against my better judgement, I unleashed Husband on the task of filling my torch with butane gas. After ten minutes of fiddling, Andrew was the only thing even vaguely smouldering. Via some applied nagging, I persuaded him to read the instruction leaflet accompanying the torch. Despite its lack of direction as to how to transfer butane gas to torch, he conceded it was a worthwhile exercise when he came across the list of applications, which included ‘engine maintenance’. He was so excited he scorched the dining room table. Bizarrely, he also – and I am reluctantly impressed by this – managed to melt my gas torch with a match. Don’t ask me what he was doing; he provided no satisfactory or even plausible response. Eventually, I managed to dissuade him from testing the gas flame on the canister of butane. It would have totally served him right had the canister exploded and fired off through the living-room window; but in retrospect, better it didn’t. Moving on. We had a romantic dinner for two at home planned (no naked flames). Evidently, the third course had to be crème brulee. Completely disregarding the fact that this was my first flirtation with making custard, and the recipe relatively complex, I picked out a slobber-inspiring coffee caramel crème brulee recipe from Epicurious. I started early, mindful of the hours of chilling required during prep. The first step involved adding coffee beans to cream, bringing slowly to a simmer, and steeping for 20+ minutes. Undaunted by the pointed paucity of coffee beans in our household, I decided to use ground espresso instead, and strain the cream through a coffee filter or piece of muslin. Indeed I AM the type of cook who keeps a piece of muslin in a kitchen drawer specifically for that purpose. Does this REALLY surprise you? Now, it turns out – and let this be a lesson to you all – that cream is too thick to pass through a coffee filter or piece of muslin. Even when you try to push it with a spoon, or squeeze the muslin to coax it through (read: splatter it all over the tiles). Then I attempted sieving the mixture. Four passes later – washing the sieve and receptacles each time – the cream still had a decidedly gritty texture. I tried again with a fresh batch of cream, this time adding a shot of strong espresso (cooled) to it. This might have worked but for the oily scum which dispersed across the surface of the cream as it heated. It followed the first mixture down the drain. On my third go, I decided to add a couple teaspoons of Nescafe to (even more) cream. This appeared to work, apart from imparting – unsurprisingly – an overwhelming taste of instant coffee; such that I couldn’t hold back a wave of nostalgia for the potential of Method II. I couldn’t understand why adding a shot of espresso to the cream hadn’t worked. Why? Why? Perhaps – yes, that would explain it! – maybe I had heated the cream too fast, thereby causing it to separate and resulting in oily scum? So I tried it again, heating the milk over a low flame – with exactly the same outcome. It was just as well I had reserved the reslut of Method III, because I was running out of cream. Making the caramel looked tricky, but posed no problem in reality. Late in the construction phase, I was regrettably assaulted by an attack of fuzz-brain and attempted to add egg yolks directly to the hot caramel cream mixture, rather than tempering them. 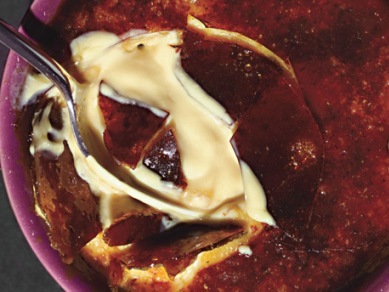 For a while, it looked like we would be having scrambled egg crème brulee. In fact, our coffee caramel crème brulees were exorbitantly delicious, including the delicate crunchy caramel topping. Yes my creme brulee looked EXACTLY like this. Bugger I realised yesterday and then I forgot to wish you a Happy Birthday. Well there is no point now since it has already passed, so I shall wish you a Wonderful Monday instead and I seriously hope that it will be less eventful than your birthday. I know that I am sometimes easily impressed, but today it has reached a new height. The fact that you went ahead with romantic dinner for two after HE scorched the dining table. Now of course I could be mistaken, perhaps he was not part of the “we” that had the romantic dinner. Perhaps it was Jed and you, or some random hitch hiker who happened to be passing at the right time. If either of those was the case I’m not so impressed. Is he sleeping in the spare room? outside? back in Dubai? Anyway Lots of Belated Love for your Birthday. I would wish you many happy returns, but you sorta already covered that, so thank you for saving me the trouble. Cian – my Monday has been rather wonderful, thank you. Lovely day here in the port, so we’ve made the most of it, sitting out on the deck for much of the morning. Although I pulled a muscle the other day, mountain biking didn’t seem to affect it, so I cycled to the top of the road for a bit of a work-out, which was fun. The romantic dinner was indeed with Husband. Instead of candles, we had a canine foot-warmer, which in many ways was cosier except for the warm, dog-like aroma emanating from beneath table. At this stage, I choose to view scorching the dining room table as more endearingly eccentric rather than an offence requiring banishment to the couch. Really, I’m not sure what that would take these days. Vet – even reading back over my post, I was amazed at my level of persistence (or pig-headedness, if you prefer). But you know, that’s commitment. In fact, in many ways making coffee-caramel creme brulee reflected being marriage to Andrew, just on a smaller scale. You’re killing me! It is going to take at least a week to recover from this post. Oh, and a much belated Happy Birthday. Hopefully, you’ll live to celebrate many, many more. Andrew’s pyromania notwithstanding. The big question is whether Andrew will live to celebrate many, many more 😀 Only kidding, he’s endlessly entertaining. And thanks for the belated happy birthday! Considering I pretty much never wish anyone happy returns (not that I wish them unhappy returns either; I’m just generally slack), a surprising number of people went out of their way to wish me happy birthday. So ta.